Because of today’s announcement of the NSW local government mergers this edition of “The Strategic Week” is being released a day later than usual and the lead item on the mergers is also longer than normal. There is also a comment on the mergers at the end of the post. Also, because of the Christmas and New Year holidays this will be the last edition of TSW for 2015. The next edition will appear on Thursday 7 January and will cover major stories from now until then, though in the interim there will be some posts on specific issues. Please have a happy and safe break. The NSW Premier Mike Baird has just publicly announced the government’s plans to merge councils which will see Greater Sydney councils reduced from 43 to 25 and regional and rural councils from 109 to 87. This means that the number of councils statewide will be reduced by 40, from 152 to 122. The Premier and the Minister for Local Government Paul Toole made the announcement after briefing NSW mayors. Their joint media release states that 35 new councils will be created as a result of the mergers – 15 in Greater Sydney and 20 in the rest of the state – and that no Sydney Council will be larger in population than Blacktown (335,000) “or have fewer than 150,000 ratepayers”. It also claims that there will be “significant financial benefits” to NSW as a result of the mergers of around $2 billion. While the Minister for Local Government has foreshadowed changes to the existing legislation, the merger proposals will be finalised and referred to the Chief Executive of the Office of Local Government for assessment under existing legislation. The Chief Executive will appoint qualified delegates who will conduct a public consultation process, after which the final proposals will be referred to the Boundaries Commission for comment. Although the government’s decision to force some form of amalgamation was widely anticipated, the specific merger proposals have produced some surprises especially when compared to the Independent Local Government Review Panel’s (ILGRP) Revitalising Local Government report released in 2013. The most notable example is Warringah Shire, which will split with the northern section to be merged with Pittwater Council and the southern section to be merged with Manly and Mosman Councils. 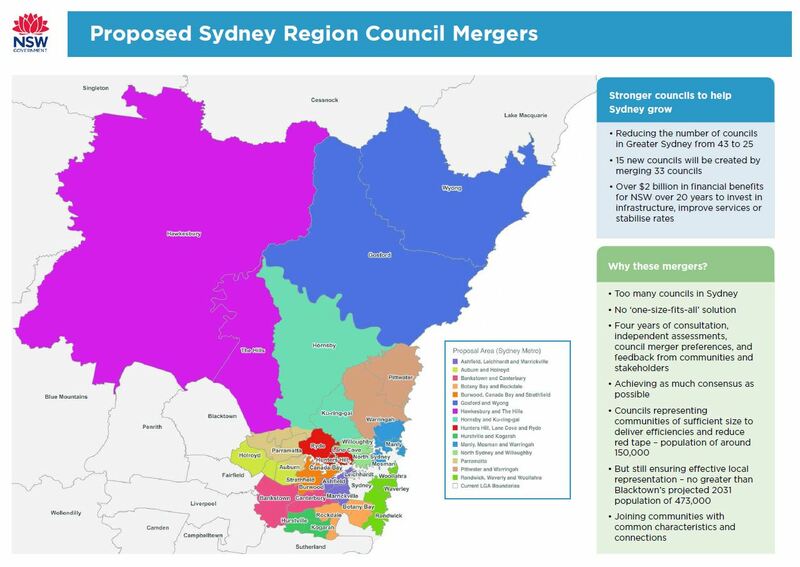 The merger proposals in relation to Parramatta and surrounding councils are particularly complex; all of Parramatta, Auburn and Holroyd and the southern extremities of the Hills and Hornsby Councils will be merged to form two new councils. One will incorporate those parts of the current Parramatta Council north of the M4 motorway as well as Sydney Olympic Park (currently in Auburn) and extend north to the M7 motorway taking parts of the Hills and Hornsby, while the other will incorporate Holroyd and the remaining sections of Auburn and Parramatta south of the M4. The only parts of the metropolitan area unaffected by the mergers are broadly speaking in the outer south and southwest – Blue Mountains, Penrith, Blacktown, Fairfield, Liverpool and Sutherland Councils and those further south – as well as the City of Sydney. 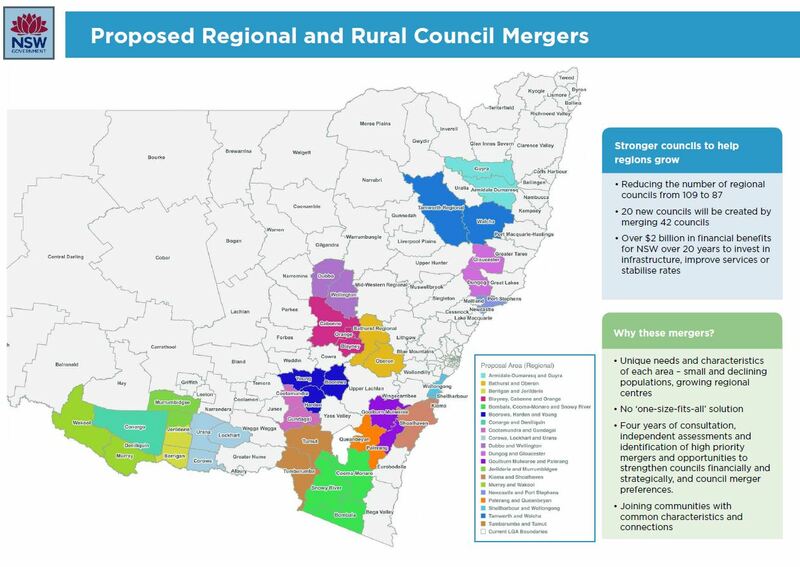 In rural NSW several mergers are proposed for councils in the mid north, central west, the southeast and southwest but significant areas such as the far north coast, lower Hunter and far west are not affected. Media reports of the early responses to the proposals suggest that many of the affected councils will maintain their long-held opposition to amlgamation – but will be joined by representatives from some councils which previously supported the concept but are opposed to their councils being split as part of the merger process. According to ABC News, this includes Warringah Council mayor Michael Regan who is quoted as saying he felt “dismayed” and “betrayed” by reports that his council would be split to merge with Pittwater and Manly councils. Fact sheets outlining the proposals can be downloaded here and a web page outlining the mergers in more detail can be accessed here. This website will also be used to provide more information about the merger review process when this becomes available in January 2016. There is a comment about the proposed mergers at the end of this post. Planning Minister Rob Stokes said “it is great news for Sydneysiders that the Greater Sydney Commission will be run by someone with Ms Hill’s experience. The Local Government NSW Cost Shifting Survey, which is conducted every two years by Local Government NSW, has identified some $670 million in costs passed on to councils by the Federal and NSW Governments in the 2013/14 financial year. “Cost shifting” involves one sphere of government shifting responsibilities to another sphere without providing sufficient funding to support the shift. The report has found the cost-shifting burden borne by NSW councils has increased by $88 million since the last survey, which covered the 2011/12 financial year. The bulk of cost shifting is mainly from state to local government. “One of the greatest ironies is that we’re able to quantify this figure on the same day that the NSW Government is off arguing against federal-state cost-shifting at the Council of Australian Governments (COAG),” LGNSW President Keith Rhoades said. Disclaimer: the writer of this blog is one of the co-authors of this report. 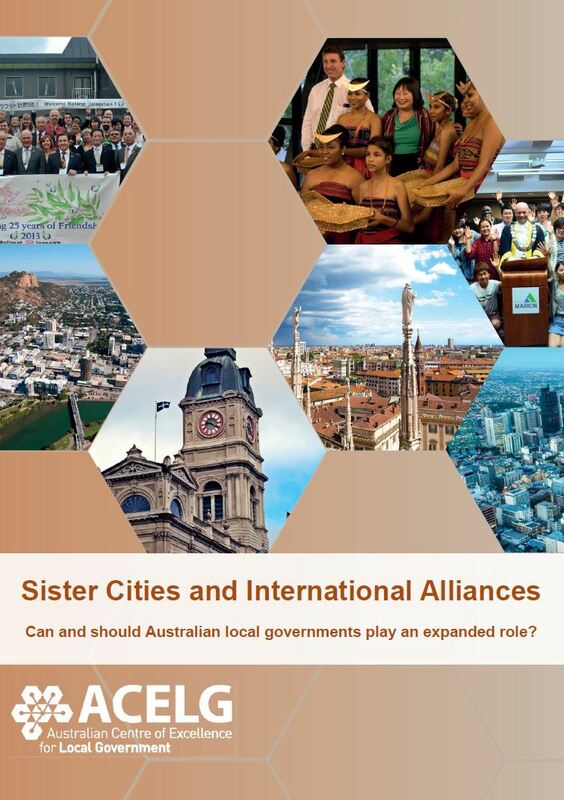 A new report, Sister Cities and International Alliances, has been published by the Australian Centre of Excellence for Local Government (ACELG). The report provides an overview of Australian local government international and sister city relationships. It includes a literature review, a quantitative Australian-wide survey, case studies, and guided discussions with stakeholders. The report describes Australian local government engagement in international relationships, assesses their value to Australian councils and communities, and attempts to provide practical guidance for councils interested in establishing or expanding such relationships. The potential impacts of the Western Sydney Airport at Badgery’s Creek on the Greater Blue Mountains World Heritage Area (GBMWHA) have been “seriously overlooked with potentially disastrous consequences on its World Heritage values and the regional economy of the Blue Mountains”, according to a submission by Blue Mountains City Council. Council’s submission also states that the Australian Government has not taken into account current international trends in the management of aircraft noise in national parks when proposing to operate a 24 hour flight path over the Greater Blue Mountains World Heritage Area. Mayor of the Blue Mountains, Cr Mark Greenhill said, “The City of the Blue Mountains is a special place of unsurpassed natural values which the draft EIS has failed to take into consideration.” Subsequently a council meeting unanimously resolved to express its opposition to the airport and to call on the Federal Government to reject the “inadequate” draft EIS. Blue Mountains City Council has welcomed the news that the NSW Government is in the final stage of approving a new Blue Mountains Local Environment Plan (LEP). The final approval of the Draft LEP2013 is awaiting the Ministers’ sign off and gazettal, anticipated to occur by the end of the year. The new LEP will conform to the Government’s standard template, but also incorporate many provisions specific to the Blue Mountains that respond to local issues and values which have not been previously adopted by the Government. Randwick City Council will collaborate with Origin Energy over 12 months to help make renewable energy and energy-saving technologies more accessible to residents. The “Randwick Go Solar” initiative is aimed at doubling the amount of solar installed by providing discount incentives for the installation of solar panels and other energy efficient appliances in homes. businesses and schools. The project will also trial battery storage technology on a Council site and a sustainable transportation option will be considered early in 2016. The Waterloo social housing estate will be “progressively renewed to create a vibrant community with a mix of private, affordable and social housing”. There will be no loss of social housing from the current 2,000 dwellings. An additional 10,000 homes and “thousands of new jobs” will be created in the precinct over the next 15 to 20 years, with the first relocations not expected until mid-2017. The decision to select Waterloo comes at the expense of the University of Sydney, which had considerably more commuters, and was made despite the presence of the Airport line. Transport Minister Andrew Constance said would have been “too costly and very disruptive” to build a station on the airport link. Transport for NSW will now linvestigate improving public transport at the university “through significant upgrades to Redfern Station and improved pedestrian connectivity”. The mayor of the Hills Shire Council, Clr Dr Michelle Byrne, has declared the NSW Government’s plans for adding 10,000 dwellings at the Showground metro station currently under construction as “unacceptable”. Urban Taskforce CEO Chris Johnson is quoted as saying “the government needs to be aware it [the SIC] will increase the price of housing. It is going to be inflationary. Direct services to the city and the doubling of peak hour services have commenced on the South West Rail Link. The line has now become part of the T2 Inner West and South Line, with services travelling to the city via Granville and a 15-minute service rather than 30 minutes in the peak. It is “anticipated” the peak 15 minute frequency will remain in place for most of the day, though some “low-demand services in the off-peak” will continue to run every 30 minutes to Glenfield and Liverpool. Transport for NSW has lodged a proposal with the Geographical Names Board of NSW to change the name of Wickham station to “Newcastle Interchange”. The yet-to-be built interchange will become the major station in the Newcastle area following the truncation of the heavy rail line to Newcastle station and will provide interchanges between heavy rail, buses and the planned light rail network. The NSW Government has awarded a tender for repairs on the Hawkesbury River rail bridge. “We’ve secured specialist marine engineers Waterway Constructions to carry out the work,” Sydney Trains CEO Howard Collins said. Media reports claim that the $2.6 million repair will come right at the end of the period nominated in an independent investigation in the state of the bridge ordered by Transport and Infrastructure Minister Andrew Constance. No details regarding the size or location of the digital signs have been provided on the government tender list though further information on the RFP is available to registered tenderers. “The Gold Coast heavy rail line is a key gateway from Brisbane to the Gold Coast region and records around 4.5 million passenger journeys per year, but is currently at capacity during peak times,” Queensland Transport Minister Stirling Hinchliffe said. The project which also involves constructing eight new rail bridges, one of which will span 860 metres, is expected to be completed by late 2017. The Australian Government has approved the on-airport elements of the Forrestfield-Airport Link rail project in Perth. Deputy Prime Minister and Minister for Infrastructure and Regional Development Warren Truss said the airport link is consistent with development plans outlined in the Perth Airport 2014 Master Plan. The link is an extension of the existing suburban Perth line from Bayswater to Forrestfield which includes a four-kilometre section within the airport. The $2 billion project which will be fully funded by the Western Australian Government. “Works will include twin-bored tunnels running east-west under the main runway and cross runway, and the construction of a new below ground Airport Central Station with pedestrian linkages to existing and future terminals,” Mr Truss said. Part of the Seaford line in Adelaide will be closed for much of January 2016 to replace faulty overhead wiring which was installed in 2013. The entire line will be closed for four days in late December and early January. After this period services will resume to Brighton but from 4 January until 25 January the section between Brighton and Seaford will be closed to allow the wiring to be replaced. The original contractor Laing O’Rourke has admitted that it installed the faulty wiring which will be replaced “at no cost to the taxpayer”. “Laing O’Rourke can confirm we were supplied a faulty batch of catenary wire by one supplier, which we are dealing with through other processes,” Director Pat Cashin said. SA Transport Minister Stephen Mullighan said the government was “absolutely furious” to be “let down” by a supplier and that it was “incredibly disappointing” to have to close the line. Auckland public transport use has soared 8.1% to 81.2 million passengers with rail patronage increasing 22.6% to 15.1 million trips, according to Auckland Council. Mayor Len Brown said the figures confirm Auckland’s new electric trains “are a huge hit with Aucklanders” who enjoy their comfort and reliability. He also claimed that the figures suggest that the patronage target of 20 million rail trips annually which was set by the New Zealand Government as a precondition for funding of the City Rail Link (CRL) will be achieved at the end of 2016, three years ahead of schedule. “At this rate of growth we will reach train service capacity next year, making the construction of the CRL a matter of urgent priority”, Mr Brown said. The preparatory works for the CRL appear to have claimed an early casualty, according to NZ Herald columnist Brian Rudman. The resulting disruptions have forced KiwiRail to shift the terminus for the Wellington inter-city services out of the Britomart terminal “to a jerry-built shipping container ‘kiosk’, 1.4km away in the wastelands of the old Beach Rd shunting yards”. “…Britomart is the focal point of an integrated transport network, with ferries, trains and buses, including the airport shuttle, all linking up at the bottom of town. It’s the closest Auckland has got to an integrated public transport system. Ejecting the one inter-city rail link we have into the boondocks is just perverse,” Mr Rudman said. Greater Wellington Regional Council has dumped TranzMetro in favour of French-based company Transdev Australiasia, in association with Hyundai Rotem, as its preferred future operator for Wellington’s metro rail service. The regional council has also decided to move to an all-electric bus fleet – in the longer term. “We expect to progressively introduce electric buses to the region within the next five years, starting with an electric bus demonstration in the first half of 2016” Mr Laidlaw said. The decision however conforms the demise of the city’s trolley bus fleet, the last in Australasia. “The Council has decided that an upgraded fleet should include new low emission double decker buses, ten of which will be hybrids. These will replace the older diesel buses in the fleet and the trolley buses, which are being phased out in 2017 because of their unreliability, the high cost of upgrading and maintaining the infrastructure and incompatibility with the new routes,” Mr Laidlaw said. Anthony Albanese, Shadow Minister for Infrastructure, Transport, Tourism and Cities, has written a strong argument in support of rail infrastructure investment in an opinion piece, “the Future is on Track“, for Huffington Post. “The development of great railway networks is a critical part of the economic development of any nation,” Mr Albanese said. He pointed out the need to diversify in the wake of the decline in mining and to develop alternatives such as food production and processing for export. Mr Albanese also argued the case for an east coast high speed rail (HSR) link. “A feasibility study completed by the former Labor Government in 2013 found that for every dollar invested in high-speed rail between Sydney and Melbourne, there would be $2.15 worth of economic benefits, Accordingly, we allocated $54 million to create an authority to progress the planning for high-speed rail and to begin to acquire the corridor before it is built out by urban sprawl,” he said. Mr Albanese criticised the current government for failing to follow up on Labor’s previous expenditure on HSR and accused it of failing to invest in urban passenger rail. “Congestion is worsening in this country, partly because in recent years jobs growth has shifted from the outer suburbs of cities in industries like manufacturing, to the inner suburbs in industries like insurance, information technology and other services. This means many Australians live in outer suburbs of cities and spend long periods commuting on congested roads,” he said, urging the government to address the problem by addressing in urban rail – and to ‘get on with” HSR and Inland Rail. The Federal Government has appointed Macquarie Capital as business adviser and Herbert Smith Freehills as legal adviser for the scoping study into “options for the future management, operations and ownership of the Australian Rail Track Corporation (ARTC)”. “As previously announced, the scoping study will also consider the implications of the Inland Rail project between Melbourne and Brisbane for the ARTC. In particular, it will consider the possible opportunity for ARTC to participate in any private sector financing, delivery and operation of the Inland Rail project,” the media release from Minister for Finance Sen. Mathias Cormann said. The Government will consider the outcomes of the scoping study in the context of the 2016‑17 Budget. According to the International Rail Journal the precise value of ARTC is unclear but its fixed assets have been valued at $4.4bn, though “no firm decision is yet to be made as to whether ARTC will be sold”. There has been media comment however over the appointment of Macquarie and Herbert Smith Freehills given their involvement in Brookfield’s bid for Asciano which might result in Macquarie owning substantial rail assets. Comment: NSW Local Government mergers – a reform of government or of governance? The local government merger proposals just announced by the NSW Government are both more radical and yet more conservative than those proposed by the Independent Local Government Review Panel (ILGRP) – more radical in that the government seems more prepared to split existing councils such as Warringah than the Panel was, but also more conservative in that the ILGRP proposals for mega councils in the Sydney metropolitan area have largely been ignored. As a consequence the proposed reduction in council numbers is more modest than that achieved through similar (though more dictatorial) processes in Victoria and Queensland which resulted in the number of councils in each state being more than halved. There will be 25 councils in the metropolitan area, down from 43, and a reduction in the number of rural councils from 109 to 87. In Sydney the government has announced that no council will be bigger than Blacktown in population (around 335,000) or have fewer than 150,000 ratepayers (in the Premier’s media release) or residents (merger fact sheet). However this is interpreted it means the largest council will continue to be Blacktown (or at least Blacktown-sized) which is well below the 500,000-plus mega-councils, three at least were proposed by the ILGRP. There are a number of likely reasons for this, the most practical of which is that some of the complex mergers required by the Panel’s recommendations were seen to be just too complex. The Government also seems to think that the new councils will be large enough to achieve “$2 billion in financial benefits” (though that seems relatively modest when spread over 20 years), create communities “with common characteristics and connections” and to “reduce red tape”. More cynically the result will be that no council and in particular the City of Sydney (which seems largely untouched by the merger proposals) will be large enough to provide an alternative power base to the state government for an aspiring politician in the way the City of Brisbane does in Queensland. Even more cynically the splitting of some council areas (most notably Warringah and Parramatta) seems designed to blunt the opposition of surrounding councils fearing a takeover by these much larger councils as much as it is to reflect emerging communities of interest. Largely unstated but implicit in the government’s proposals is the desire to use mergers to drive an improvement in the strategic capacity of councils. While this is likely to occur to a degree it remains to be seen whether this will extend beyond the local level; the information provided to date is silent about whether and to what extent the reforms are expected to drive the strategic engagement of councils in planning and management at a regional or in the case of Sydney at a metropolitan-wide level. Part of the problem was that the ILGRP provided limited guidance on this in its report. While the panel made detailed suggestions on the creation of Joint Organisations (JOs) in rural areas as a platform for councils to collaborate and engage in regional planning and management processes, it regarded the JO option as a last resort for the metropolitan area if its amalgamation proposals were not implemented. In the event that amalgamation proposals did occur the Panel favoured the introduction of a Council of Mayors similar to that operating in South East Queensland, though this was not discussed in any detail. The difficulty with this is that the experience in Queensland and elsewhere suggests that such a body is only really successful if the number of participating mayors is relatively limited; 25 is likely to be too many. Consequently if there is to be any real improvement in local government engagement in strategic planning at the metropolitan level some sort of sub-regional structure based on either the existing ROC model or the emerging JO structure will be required for Sydney. Nowhere is this discussed in today’s announcement so a key question therefore remains – regardless of whether the government’s reform goals are the right ones or whether the mergers will achieve them, should they be solely about reforming councils or also about reforming – and expanding – their role in the urban and rural governance and management process? Disclaimer: the author wrote a discussion paper for the ILGRP on options for regional collaboration. This entry was posted in Governance, Growth, Infrastructure, Local Government, Planning, Public Transport, Regions, ROCs, Sydney metro area, Transport, Western Sydney and tagged Airport, Badgerys Creek, Federal Government, governance, Infrastructure, light rail, Local Government, metro, Rail, Regional governance, regions, ROCs, State Government, Strategic Planning, Sydney metro area, Transport, Western Sydney. Bookmark the permalink. I don’t believe the government fully considered building the Waterloo metro station on the existing airport line. If they had, both a station at Sydney Uni and Waterloo could have been constructed. I personally believe that Urban Growth was pushing for Waterloo station to be built as soon as possible so that redevelopment of the area could begin quickly, rather than have to wait an extra couple of years for the planning of altering the airport line to be completed. It seems pointless that the government had a forum for submissions regarding the location of the new metro station, when they clearly disregarded that the Sydney Uni station was far more popular in the community, would have attracted far more passengers and would have benefited more people. I’m not being totally serious, but at the rate Sydney Uni is expanding eastward (its already consumed the entire suburb of Darlington) it won’t need a new station. 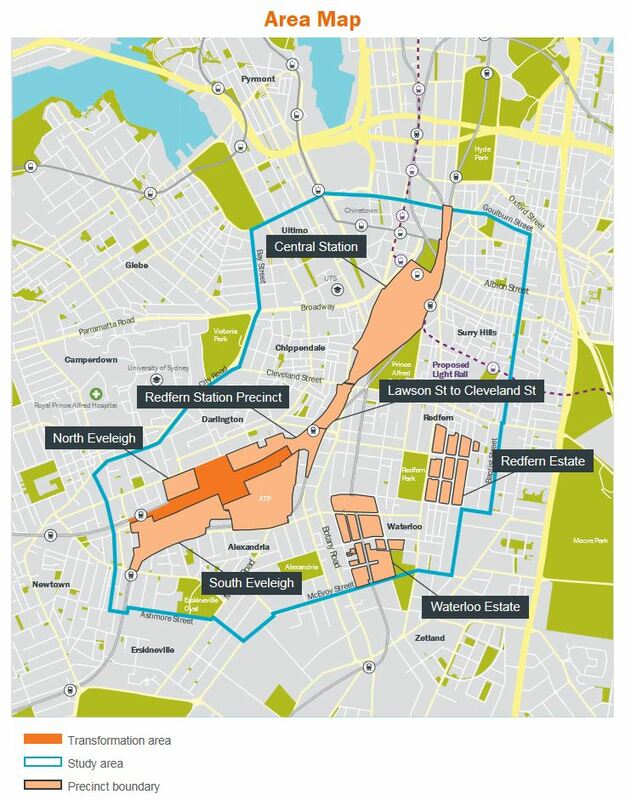 Its boundaries will be right next to Central and Redfern. Yes, I reckon the Waterloo option was the only one really being considered. All that government-owned land to develop! We could be cynical about that, but I for one won’t be crying crocodile tears when those existing Housing Commission tower blocks come down. Its a fantastic opportunity to achieve a lot. Also underlines the true nature of Urban Growth, which thankfully at least seems to be working in lockstep with NSW Transport (Metro division). And for once Sydney’s weekend press had a non-agenda driven article about what’s behind the Waterloo decision, plus some relatively objective discussion. Jeeez, that can’t last! Was everyone on holiday?